In 2008, Barack Obama became the 44th U.S. President and the first person of African American descent to hold this position. 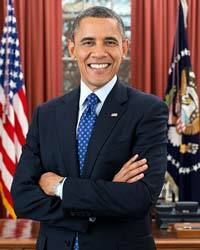 President Obama is an attorney and was a community activist in Chicago while earning his law degree. He was also an instructor of constitutional law and worked on behalf of civil rights legislation. President Obama was a State Senator in Illinois from 1997 to 2004. In 2000 he ran for the U.S. House of Representatives, but was defeated in that pursuit. He first began to gain national attention as a candidate for the U.S. Senate in 2004. His keynote address at that year’s Democratic National Convention was widely heralded. He would go on to defeat Hilary Rodham Clinton in the 2008 Democratic primary for President and win the general election versus John McCain. President Obama received the Nobel Peace Prize in 2009 and in 2012 won re-election to the office of President by beating Republican candidate Mitt Romney. The early years of his first administration was marked by an economic stimulus package intended to revive a downward spiraling economy. He would also implement the Affordable Health Care Act, also known as “Obamacare.” Of late, President Obama has ended the Iraq War and began to withdraw troops from Afghanistan. It was under his watch that the September 11th, 2001 mastermind, Osama Bin Laden was killed in 2011. Barack Obama was born on August 4th, 1961 in Honolulu, Hawaii. His mother was an American woman born in Wichita, Kansas. His father was a native Kenyan. Shortly after his birth, Barack’s mother separated from his father and moved to Seattle, Washington. She attended college there for one year prior to moving back to Hawaii. His parents would formally divorce in 1964 and the young Barack would only see his Dad one more time, in 1971, prior to his fathers untimely death as a result of a car accident in 1982. As a child Barack Obama lived with his grandparents while his mother would travel for educational and vocational reasons. She would pass away in 1995 from ovarian cancer. Following high school, Mr. Obama was a student at Los Angeles Occidental College for 4 semesters. He would then attend Columbia University’s, Columbia College in New York. From there he would be hired by a law firm in Chicago as director of community affairs. He graduated from the Harvard Law School with honors in 1991 and returned to Chicago. Mr. Obama became an attorney dealing with civil rights issues while working at the University of Chicago Law School. Barack Obama was elected as an Illinois State Senator where he served from 1997 to 2004. He would go on to secure a seat as a United States Senator from Illinois in 2004. He would serve in that post until running for and winning the U.S. presidency in 2008. He was reelected to the office in 2012. Barack Obama met Michelle Robinson in 1989 while they both were employed by the same Chicago law firm. The pair would attend company social events, but not as a couple. In fact, Michelle turned down Barack’s initial attempts when requesting a “real date.” She finally relented and their bond grew which ultimately resulted in them being married in 1992. They are the parents of two daughters, Sasha and Malia.